I realized early this month that I never posted a recipe for one of the specialties of the region in France where I grew up, Provence. 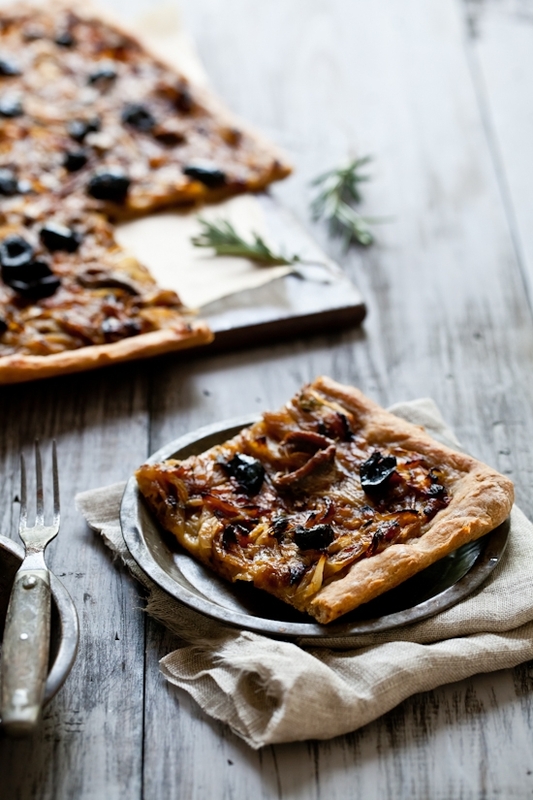 Pissaladiere, a thin tart topped with onion, anchovies and olives is indeed one of the quintessential dishes of the area. Yes, today you will find me and the recipe for this French specialty over here on Asha's blog, Fork Spoon Knife. And please, wish her a happy three year blog anniversary too! That's something to be celebrated! j'adore la pissaladière et dès que je pars dans le Sud je me débrouille pour en déguster de la locale ! merci pour ces belles photos, encore ! et merci pour votre livre que je suis en train de lire. Sounds absolutely delicious...I'm hotfooting it straight over there right away! Looks delicious - any chance of a gluten free version of the dough? 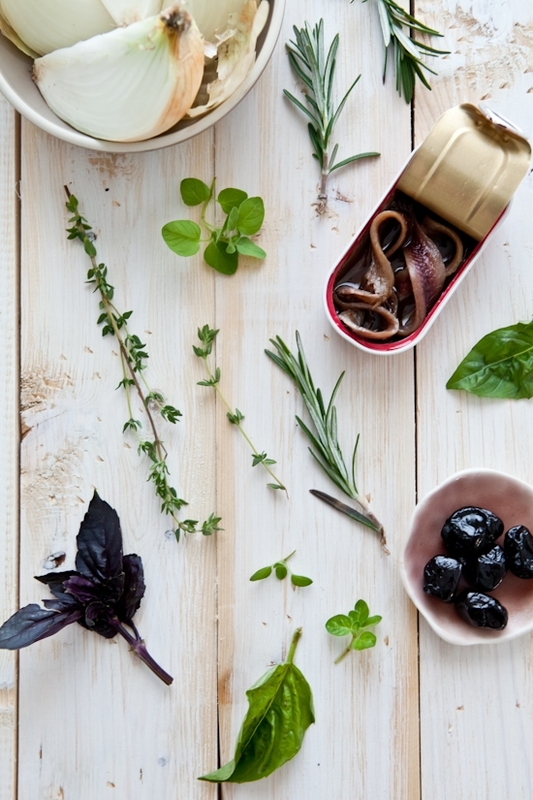 Only you could make a can of anchovies look that gorgeous! This recipe sounds amazingly mouthwatering. Lily: Check this one on Gluten Free Girl. Helene, this looks soooo good! Thanks for posting recipes. It's encouraging me to not give up on cooking and baking in this heat! I love Asha's blog, I'm so excited to be able to meet her this Fall! And I love pissaladiere as well, I remember a warm slice of it in Aix-en-Provence this summer, definitely an extraordinary experience! Helene, I just wanted to stop in and tell you how much I appreciate your Plate to Pixel. I am devouring it slowly but surely! I have read the first section and churned slowly through the camera settings. I have a new Canon 60D and feel shamed in owning it and touching that "automatic" setting. I understand the individual settings but putting them altogether is my current struggle. ISO is not clearing up in my head yet. I know you don't know me but I feel like I know you, of course, through your blog. Keep my name handy for when you put together another workshop. I read about the one in Santa Fe. BTW, We were in Provence recently. I can't say I noticed the pizzaladiere because I couldn't keep my eyes and mouth off of the brioche! Bonne journée! Sarah of "Snippets of Thyme"
I just found your blog! You share so many delicious recipes! I´m excited to be a new follower of you! This looks lovely. I make a similar dish, but since none of my kids will go near anchovies, I leave those out. I'm sure they give it a good 'punch' though. Maybe I'll make up a batch this way...just for me! Pissaladiere is one of my favorites. A brilliant combination of flavors. Going over to check out your guest post right now. I made this last month. Mine is not an authentic version as I threw some feta on there but it works for me. As always your lighting is sublime. This is my favourite provencal dish! Wow... I LOVE pissaladière. This one looks absolutely delicious. I make this a lot in the summer for guests, it's easy, but looks so impressive!!!! How fun! I will head over to her blog to check this out. Not only does this look delicious, but that last photo is perfection! I'd imagine a glass of champagne would accompany this tart so well!